White 2 Violet™ you will experience darkness like never before. Formulated with more accelerators, darker DHA and natural bronzers will allow you will go 3 shades darker – instantly! Added violet tones will help to counteract orange tones in the skin so you develop dark, bronzed, envy worthy results- every time! 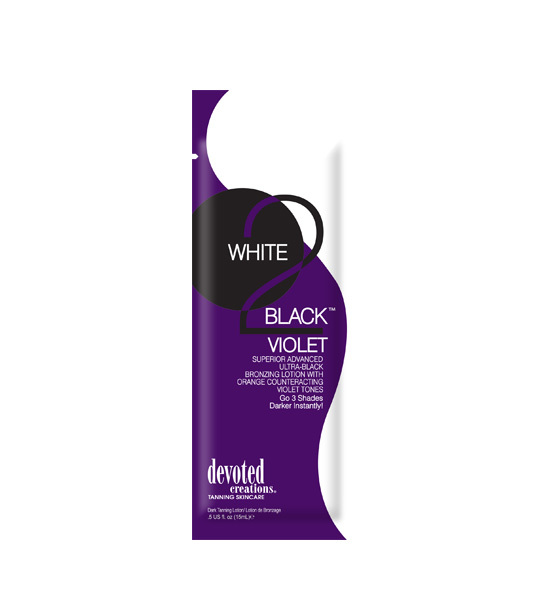 For fast, dark results and ultra hydrated skin- the choice is simple- White 2 Black Violet™! • Superior amounts of DHA & Natural Bronzers will allow for a long lasting bronzed result. • Violet Tones- Counteract orange tones in the skin. • Blackberry Extract - Boosts the production of collagen and elastin improving the skin’s firmness and elasticity. • ALA Technology™ - Reduces appearance of fine lines and wrinkles. • Black Tea Extract - Strong antioxidant with astringent properties that helps to reduce blemishes. • Acai Oil - Powerful fruit oil loaded with antioxidants.